Chow Tai Fook is a powerhouse, being the largest retailer in Asia and one of the largest in the world. 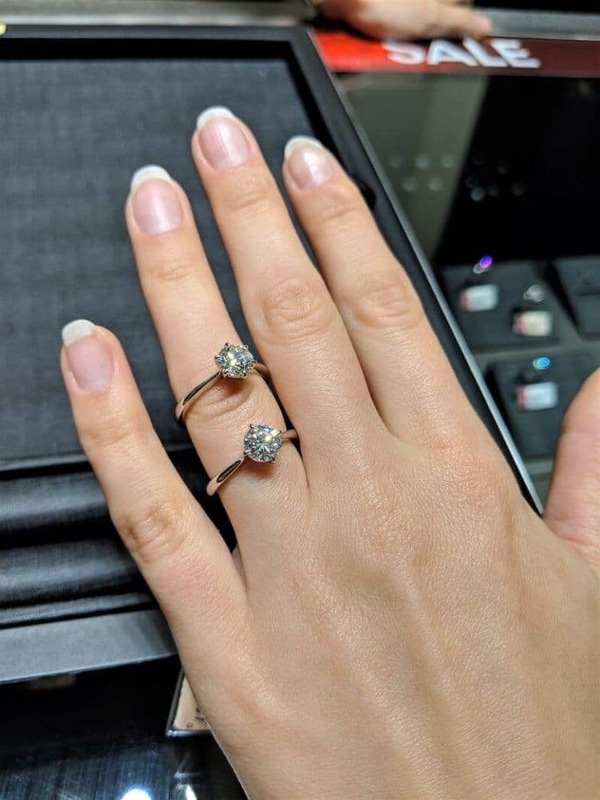 They have an overwhelming presence in Hong Kong with dozens (if not hundreds) of retail locations, all stocked with a fair selection of engagement rings. 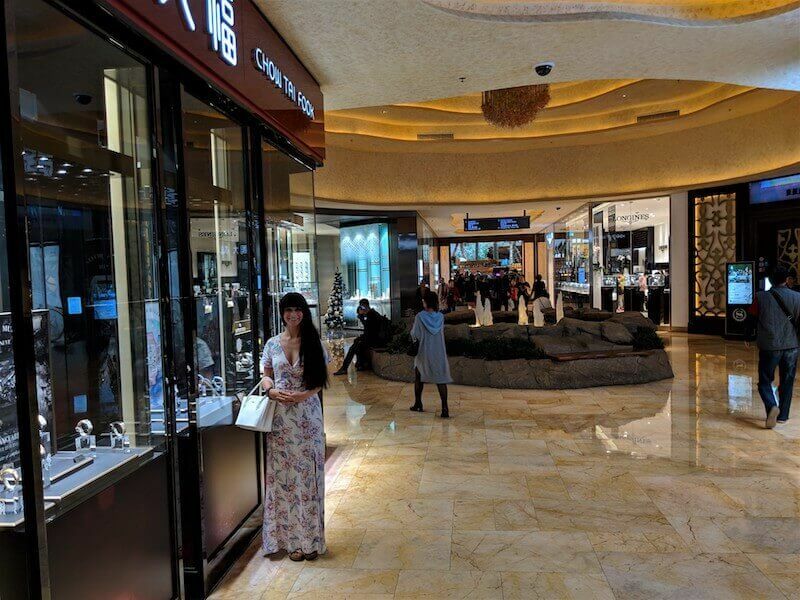 The experiences in the Chow Tai Fook stores we visited in Hong Kong/Macau were pleasant, but nothing to write home about. It wasn’t particularly luxurious and in the busier stores, the staff seem harried. Overall, the quality of diamonds at Chow Tai Fook were above average and they had a good variety to choose from. Unfortunately, the prices were just a tad too high for my liking. I understand that it costs more to run a physical location than it does for online retailers to operate, but I didn’t feel like they offered much of luxurious experience to justify the 35% premium on their rings compared to a reputable online retailer like Blue Nile. Chow Tai Fook has been in business since 1929. Originally founded in Guangzhou, China, the company has shifted its location several times — first to Macau in the 1930s, then to Hong Kong after war broke out between Japan and China. Originally a jewelry store, the company diversified into real estate development, transportation and telecommunications in the mid-to-late 20th century. Today, it’s a public company traded on the Hong Kong Stock Exchange. 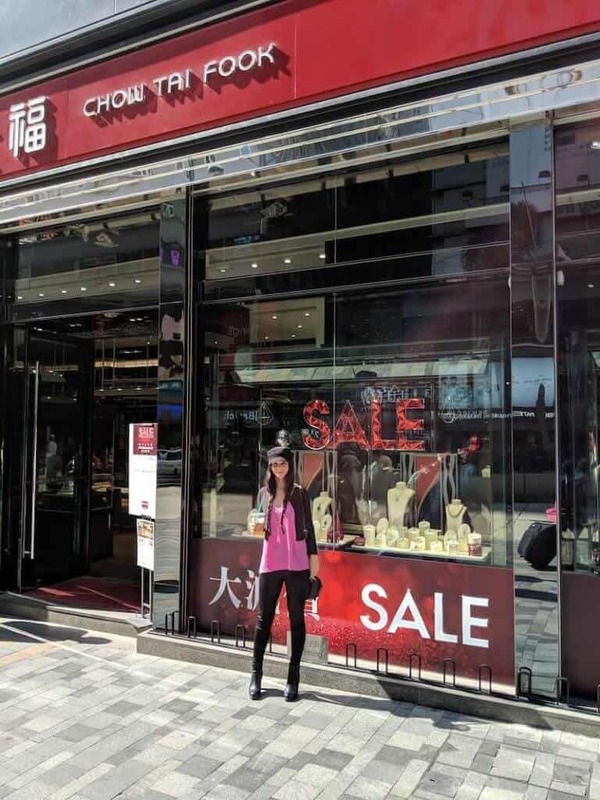 With more than 1,000 stores in mainland China and countless outlets in Hong Kong, Chow Tai Fook is one of the world’s biggest jewelry retailers. Over the decades, it’s set numerous records for diamond purchases, including the purchase of a 255.61 carat diamond for US $10 million. I think they should rename Hong Kong to Chow Tai Fookville. In our four days around Hong Kong, I don’t think we ever went three blocks without seeing a Chow Tai Fook store. There were areas (mainly around Nathan Road and Hennessy Road around Central) where there are two or three Chow Tai Fook storefronts on every block. It’s absolutely amazing. We had a similar experience in Macau. We got out at the Tsim Sha Tsui station in Kowloon and were able to see two Chow Tai Fook stores right from the exit. The location we went into on Nathan Road was busy, but not as crowded as some of the other locations. It was a fairly large store that gave off a nice busy vibe. We wandered around a bit trying to find the diamond section (like other jewelry stores in Asia, most of the in-store displays were focused on gold). Once there, we were greeted warmly by one of the salesman. He was pleasant, but you could tell he was looking around to make sure no one else was being ignored. Given how busy the store is, this seemed to be par for the course. 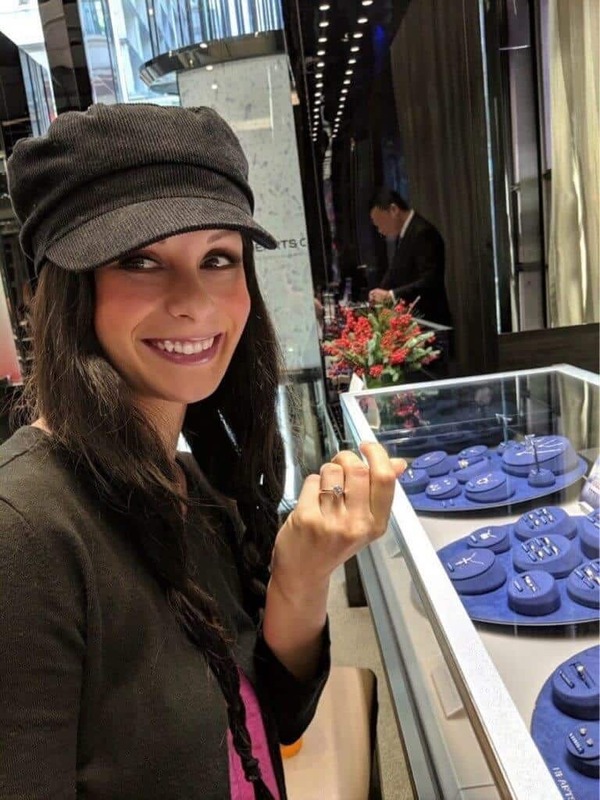 It was nice to see that there were only GIA and AGS certified diamonds at Chow Tai Fook. It is far less common to find other, less legitimate, certificates in Hong Kong, but there are some. He moved us towards the Hearts On Fire display and was quick to point out their overwhelming brilliance. We looked at a beautiful 1.22ct J color, Si1 clarity diamond. The inclusion was slightly noticeable to us, but they were faint. The diamond was set in a simple platinum setting and the total price was HK$91,960. The price, as well as the rest of the prices from Chow Tai Fook we list in this guide, was the final price we were given after negotiations and discounts. We asked to see a non-Hearts On Fire diamond for comparisons. He showed us a 1.51 H color, VS2 clarity set in an 18kt white gold solitaire ring. The diamond was a very good cut, but it still looked very nice and it was eye-clean. The price for the ring was HK$130,000. We also looked at a one carat diamond, but the salesperson was hard at work trying to upsell us to the 1.51ct H color diamond or the 1.22 ct Hearts On Fire diamond. As is to be expected at a high end casino, the Chow Tai Fook in the shopping area of the Sands Cotai Resort was beautiful. It was elegant and classy, with a more calming atmosphere than the bustling stores we saw in Hong Kong. The staff at this store had a very cool way of presenting the engagement rings. Each ring had an NFC tag on it. When they took each ring out of the case and put it on the black pad to showcase it, the details of the ring would automatically pop up on the screen next to us. Here we looked at a couple of one-carat diamond solitaire engagement rings. Both of the rings were made out of 18kt white gold. The first diamond was a stunning 1.03ct G color, VS2 clarity diamond. Despite having a 60% table, the diamond had a lot of fire and brilliance. The second diamond was an underwhelming 1.01 G color, SI2 clarity diamond. It was well cut, but the inclusions were right in the middle and very noticeable. Both of the rings were priced at MOP$117,500 after discounts. This was a little surprising given the disparity in quality. Let’s start with the Hearts On Fire diamond we saw. It was clearly a beautiful diamond, but was it worth the money? Here is a stunning 1.26ct J color, VS2 clarity Astor cut diamond from Blue Nile that’s available for HK$59,483. The diamond is just as brilliant as the Hearts On Fire diamond, and is slightly larger and one grade higher and clarity. If you pair it with this beautiful platinum setting the total cost will be HK$65,693. That is almost 30% cheaper than the Hearts On Fire ring we saw at Chow Tai Fook. Hearts On Fire is a premium brand focused on superbly cut diamonds. As we say in our review of Hearts on Fire, there is nothing “special” about them. This Astor cut diamond from Blue Nile is just as well cut as the Hearts On Fire diamond and will have comparable fire and brilliance. Now, let’s take a look at the 1.51ct diamond we saw. It was very brilliant despite being a very good cut, so we will compare it to an excellent cut diamond. Here is a 1.50ct H color, VS2 clarity diamond for HK$85,500. We paired it with this white gold solitaire ring and the total price was HK$88,640. Here we save even more than we did with the Hearts On Fire diamond, coming in at 32% savings. Lastly, let’s take a look a the diamond we saw in Macau. I will ignore the G SI2, because it was an ugly diamond (and terrible value, considering it was the same price as the superior diamond they had there). 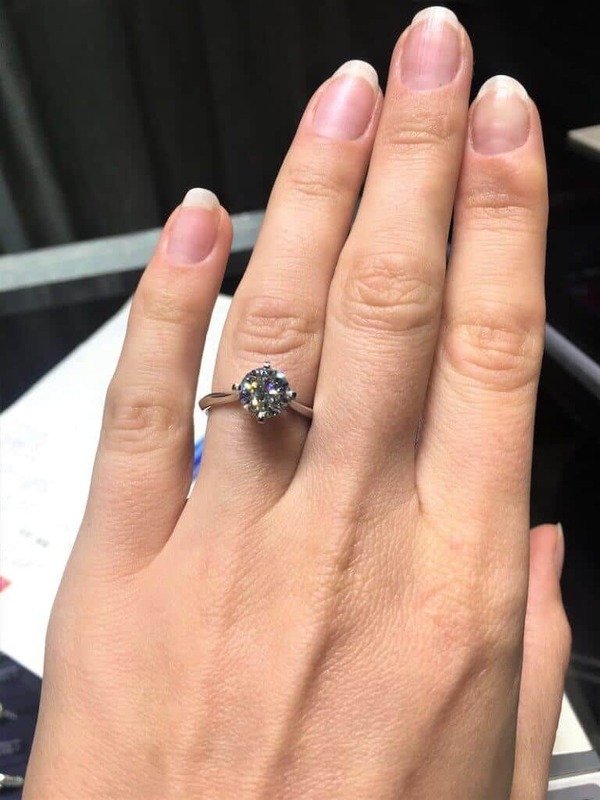 Here is a stunning 1.02ct G color, VS2 clarity diamond from Blue Nile for MOP$58,460. If you pair it with this similar white gold setting, the total price is MOP$62,100. That’s a whopping 48% cheaper than the similar diamond ring we were shown by Chow Tai Fook in Macau. As I’ve covered in my guide to online jewelry retailers like James Allen and Blue Nile, brick and mortar jewelry stores will always charge more than reputable online jewelers, since it costs far more to run a physical retail business than an online one. Chow Tai Fook is a huge business with over 1,000 retail locations. Each of these locations has its own range of overheads, from rent and utilities to employee salaries. Because of this, the prices you’ll need to pay for diamond jewelry from Chow Tai Fook is higher than what you’d pay from a reputable online jeweler. Most of the diamond rings we saw at Chow Tai Fook were about 35% more expensive than similar options from Blue Nile or James Allen. Buying a diamond ring from Chow Tai Fook lets you see it in person before you decide to make a purchase. With countless locations in Hong Kong (particularly on Nathan Road), it’s very easy to drop in and take a look at the available inventory. With this said, Chow Tai Fook isn’t a good option for value. By buying from a reputable online diamond retailer like James Allen or Blue Nile, you’ll save about 35% compared to what you’d pay at Chow Tai Fook. If you’d like more personalized help, feel free to contact us.